Quality Commercial Cleaning (QCC) is a highly respected professional cleaning service company that covers London and Surrey. QCC was set up to provide a cleaning service to put the clientâs needs first. Built on years of experience in the cleaning industry, QCCâs client-first approach has built up a large network of satisfied customers that has made QCC one the most respected cleaning companies in London and Surrey. Quality Commercial Cleaning... Read more offers a wide range of cleaning services to suit the needs of all the businesses in London. 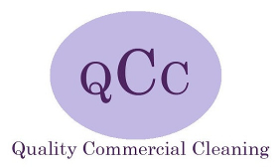 QCC is a dynamic London cleaning company that offers a bespoke service based on the needs of its individual clients. All QCC staff are highly professional, experienced, friendly, and use only quality cleaning products, materials and equipment. Quality Commercial Cleaning guarantees a flawless cleaning service suitable for offices, homes, shops, theatres, schools, public buildings, industrial premises, clubs, gyms and restaurants. Clients receive a tailored service designed around their business and budgetary requirements. Quality Commercial Cleaning services are tailored for the needs of every single client. It does not matter if you have booked an end of tenancy cleaning of couple of rooms, or a spring cleaning of the whole property- we provide the same quality of service to every client.